Sam has been teaching piano and percussion for over 20 years. She enjoys working with all ages and will work hard to help you achieve your musical goals. She has a music performance degree from Eastern Washington University (1992) and since then has dedicated her life to teaching and performing in the Spokane area. 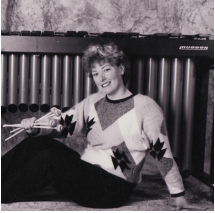 She has been a member of the Washington Air National Guard Band, where she performed in the Concert band, Dixieland band, Marching band and as a Marimba soloist for the last 20 years. She has also worked with many local High school programs.